Following the fallout of Civil War II, Avengers Ms. Marvel, Nova and Spider-Man strike out on their own – joined by Cyclops, Viv Vision and the Totally Awesome Hulk! Six young heroes determined to change the world – and they’re only the beginning! I’m just going to start off with the bad. This is the first comic that really is meant to kick off Marvel‘s post-Civil War II world. The problem is we’re another 2+ months out from knowing how that event ends, so there’s a lot of questions left out there and some references that leave you scratching your head. But, that little bump aside, Champions #1 firmly plants a flag as to what it is, a return to positive heroes who do more than just punch the bad guys and cause damage. These are heroes who also stay around to help clean up, fix their mess, and, more importantly, let the justice system do its job. Written by Mark Waid, this first issue is beyond enjoyable with a fun positive vibe that seems to bounce along at a solid pace. These are heroes without the killing squarely aimed at a bit younger crowd or for folks who want heroes that might punch the bad guys, but also have a clue they’re causing damage when doing so. The series seems to take on that conundrum that exists in superhero comics where you have heroes that can do amazing things, but they never use those powers for basic things, like fixing the building they just damaged. Spinning out of All-New, All-Different Avengers, the series’ heart is its core heroes of Ms. Marvel, Nova, and the Miles Morales version of Spider-Man that all have seen the Avengers for what they are, a wrecking crew. The discussion and events that lead into their teaming up feels natural and honest with some heartfelt moments peppered throughout. I can’t say for sure this is how kids of that age talk, but Waid also doesn’t attempt to painfully write their age either. It all works, and works really well. Waid is helped by Humberto Ramos‘ art which is absolutely amazing. He’s helped by inker Victor Olazaba and colorist Edgar Delgado for a combination that’s some of his best recent art. There’s some flashbacks which are colored kind of like old-time films in a slight brown tint that look amazing. Ramos’ art also adds to the youthful energy of the characters and comics with colors that feel like they pop off the page. I had no idea what to expect going into this series and coming out the other side… it’s awesome. It has an energy and vibe that’s missing from a lot of comics. It has action, humor, solid banter, and more importantly characters that feel very aware of what they’re doing. Marvel has position the series to be the center of what comes next and if this is any indication of what’s coming, bring it on. “Yes! This is what being a Spider-Man is all about! Swinging through the sky–a New York sky–patrolling the city. Every moment a chance to make a difference. To fight the good fight. Not only is Peter Parker back, but so are his quick-witted comebacks. “Silly Rabbit. That’s what you get for putting all your Faberge Eggs in one basket.” Lol, love it…and the numerous other one-liners in the first few pages alone! Glad your back Peter. Peter Parker has, indeed, returned in Marvel’s new Amazing Spider-Man #1 and he has a lot of cleaning up to do after the mess that Doc Ock created and left from the past 30 plus issues as Superior Spider-Man. The task before him may seem insurmountable to most, but we have faith That Peter will rise to the task and throw in a few one-liners in as well. I had thought for a moment that ASM #1 would be a sort of reboot for the Spider-Man franchise, since Marvel decided to renumber the issue #1 instead of continuing to #701. Then I thought, “Where would all those problems and situations that Doc Ock created go?”. So, what we ended up with is a new element to Spidey’s history and our beloved Peter Parker is thrust into repairing his image, career and relationships at the same time. Leave it to the amazing Dan Slott to conjure up another intriguing and unique story for Spider-Man immediately after the Superior Spider-Man chapter ends. 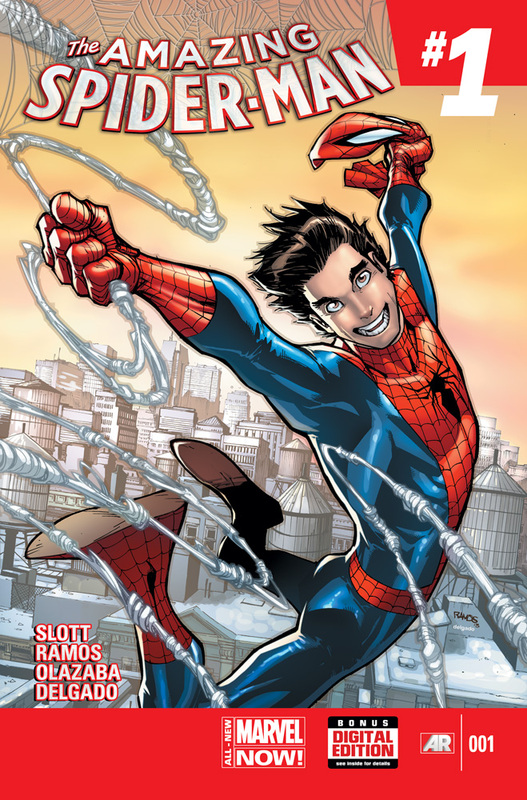 The first arc is aptly named “Lucky To Be Alive” and, as mentioned, begins with an added element to Spidey’s history. As we all know (you should know this), Peter Parker was bitten by a radioactive spider and subsequently gained its speed, agility, and proportional strength. What we didn’t know is that someone else, a female, was also bitten on the ankle by that same spider. We don’t know who she is, but we should find out before 2014 is over. It will, no doubt, be a great story that Dan Slott introduces to Spidey’s world and I am very curious who it could be. Parker’s first real villain in ASM is the bad-guy group, The Menagerie. He takes them down with ease, and you know he is back when you catch yourself smiling and/or laughing at all of his one-liners. A lot of problems arise out of this much anticipated first issue and we can tell right away that Parker will have his hands full for quite some time. He will have to deal with Electro and the other prisoners at Conway Penitentiary that escaped when it was destroyed from the Goblin attack. While Peter is catching up with everything Doc Ock left in his wake he figures out that Doc wasn’t just twiddling his thumbs in the Spidey suit. He is now the owner and founder of Parker Industries as well as receiving his doctorate. I am sure he can pull that off because he is a genius after all, but Doc wasn’t all about the Spidey suit and getting degrees. He fell in love…as Peter Parker. Not only did he fall in love, but he was going to marry her. Which, of course, Anna Maria figures that out and patiently waits for Peter to return home. She figures out something else too, but I won’t spoil that for you. I don’t think anything could have prepared our webbed hero for how to handle this situation. As much as I loved Superior, I am glad to have Amazing Spider-Man back on my Pull-List. The ink by Humberto Ramos is nothing short of outstanding and is a staple of of this franchise. Every page jumps out at you and the colors really pop in each and every panel. Edgar Delgado does an equally impressive job. Dan Slott appears to have many wonderful things planned for ASM and it’s going to a great year for the fans. I enjoyed Superior Foes and Team-up and thought they were really good series (Foes was so funny). However, I would trade anything to have Peter Parker and The Amazing Spider-Man back. – I thought this was hilarious…The old woman telling Peter, “Put some clothes on! Who do you think you are? Miley Cyrus?! – How will Captain America and The Avengers get the proof they need that this is the real Peter Parker? – Will Peter ever access Doc Ock’s memories for anything? Or will he think it’s too dangerous to even try? – How will Peter break the news to Maria? Is this situation going to be a big problem for him? – One of the most important questions, I think, is ‘what happened to Doc Ock?’ Where did he go? Thank you for checking out my Review! Please respond below so we can discuss the issue and Spider-Man further!